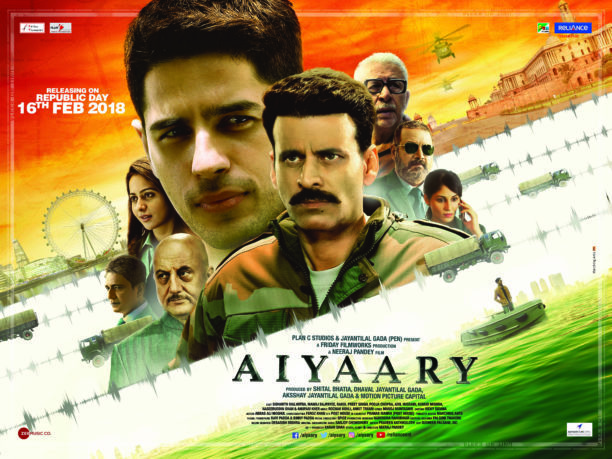 At first Aiyaary seems less seamless than it actually is. Where is all this leading to? You wonder at the outset, as writer-director Neeraj Pandey sets up what eventually turns out to be pieces of a jigsaw that fits perfectly into the mindboggling zigzag of India’s political conditioning in contemporary times. It is very hard to point out plot points inAiyaary that stand out to build the compelling construct on corruption in military forces. It seems miraculous that Siddharth Malhotra, playing an army renegade, is allowed to mouth dialogues that openly castigate the corrupt political system. Illegal arms-deal scams are not only whispered into the commodious plot. The narrative screams in wounded agony at the dizzying heights of corruption in the highest places. Early in the narrative there is a sharp exchange of malevolent words between an army general and a former armyman who wants to negotiate a defence-purchase scam on behalf of unnamed arms dealers. Here we see two seasoned actors, Vikram Gokhale and Kumud Mishra (the latter a weclcome staple in Neeraj Pandey’s cinema) spar across the table with a fanged finesse that would give Meryl Streep and Goldie Hawn in Death Becomes Her some ‘feud’ for thought. The performances are not consistently polished. Some of the actors are impossible high-pitched clamouring to make themselves heard over the bustling officious background music by Sanjoy Choudhary that could have been less hammering in its impact. Blessedly Manoj Bajpai and Siddharth Malhotra play against each other with vitality and force, giving both heft and history to their parts of a veteran who won’t desert the cause and the junior who won’t stay within the corrupt system. The confrontation sequences between Bajpai and Malhotra are a treat to behold, largely because they play not for effect but for reasons that come from within their conscience. There are two vivid flashbacks in Kashmir where we see the two heroes’ heroism from each other’s point of view. Taking the bullets from the enemies with a refreshing lack of flourish associated with cinematic soldierliness, the two protagonists represent patriotic valour at its most played-down scale. Malhotra is specially surprising, fine-tuning his inner pain, channelizing the Ranbir rather than Ranveer within himself, to deliver a mellow blow to a system of governance that fosters corruption. Adil Hussain as an arms dealer has one very powerful sequence with Bajpai where the two actors address a devastating debauchery in the defence system with lethal elan. True to the action genre the female characters are sketchily written. Capable actresses like Juhi Babbar and Nivedita Bhattacharya scarcely get to make even a fleeting impression. As for Rakul PreetSingh as Siddharth Malhotra’s love interest, she looks clueless about her function in the plot. But truly, my favourite performance in this film of indubitable force and inner strength, is by Naseeruddin Shah. His cameo as a common man who, according to the smart script, brings out the Adarsh Housing Society scam, is peerless. If you remember, Naseer that actor par excellence had played the Common Man screaming in protest against corruption in politics in Neeraj Pandey’s debut film A Wednesday. That Naseer again plays a Common Man capable of shaking the inert decadent political system in Pandey’s best work since A Wednesday, is no coincidence. Good things were waiting to happen to the political thriller in Hindi cinema. It takes a vast amount of integrity and guts to bring to the screen a drama that dismantles the image of sarey jahan se achcha to focus on the corruption within. Designed to poke needles into our collective national conscience Aiyaary is a film that must be seen by every Indian. Neeraj Pandey is no Costa-Gavras. But for our hard-earned bucks this filmmaker drives in a forceful message on subterfuge in the the defence hierarchy better than any Indian filmmaker. One day I hope to see him do a film on Bofors and then the Rafel deal to complete his defence trilogy.